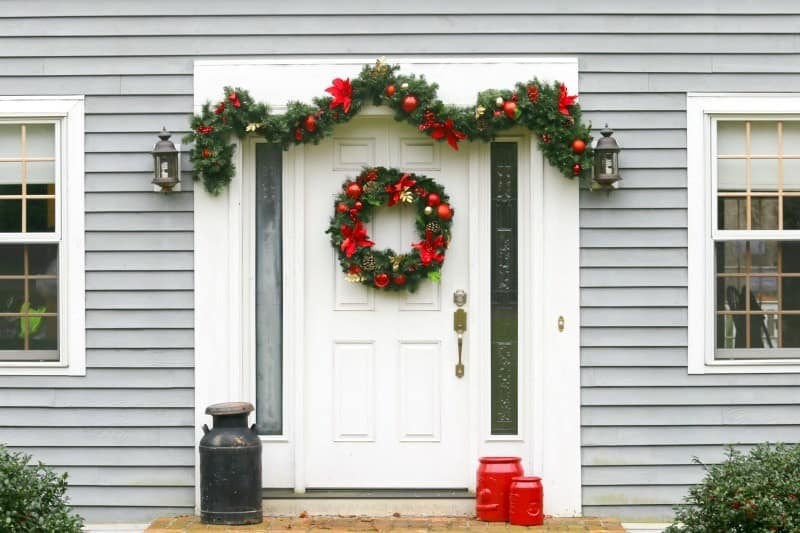 This easy holiday front door look is sponsored by BJ’s Wholesale Club. One of my favorite places to shop is BJ’s Wholesale Club. I can get essentials for the family in bulk and at great pricing (and they take coupons, YAY!) but there’s ALWAYS something fun and fabulous I find that I just can’t leave BJ’s without, especially around the holidays. It might be decor, or a book, kitchen gadget, or gift idea, but there really is always something I can find when I go. Being a Member of BJ’s Wholesale Club is something we’ve been doing for gosh, 15? 16? years now! I think you guys may remember (here) that I struggled with our front door “look” for Fall. I’m still adjusting to the larger front door at the new house and figuring out how to decorate for holidays, and I’m always appreciative of the ideas you guys send me. Of course, now I’m thinking about the Christmas holiday and getting excited to decorate (or maybe got excited…since it’s hanging at the door!) once again. In previous years, I got a live wreath for the door. Usually with one plain bow. Last year, I think I did two little Alberta (?) spruce trees with the wreath, but they were too small and were dwarfed by the door size. THIS year, I’ve decided to go a little more ornate. I found this really pretty pre-lit (how did we live before pre-lit????) Berkley Jensen 28″ LED Decorative Wreath and Berkley Jensen Decorative Garland with LED Lights at my local BJ’s and couldn’t wait to get them up to see how they look. My husband was not *quite* as excited as I was to get these up in the cold at 8:30 on a weekend night, but he’s a good sport and did it anyway. I reminded him how much he loves me. He reminded me how much he doesn’t love these projects I come up with…. It was well worth it. Look how pretty! I love the colors against the grey. Who knows what color my front door will be a year from now, although I almost want to keep the white because of how colors just *pop* against it for decorations! Now, I went with the red poinsettia theme for my garland and wreath, but your Club may also have a creamy white poinsettia with more gold in it-I love that you can choose from different color schemes even with the holiday products available at BJ’s. My favorite part of this whole look? Well, second favorite. I’m loving the red and bits of gold and bright green on both the wreath and the garland, but… You won’t believe that I got both the wreath and garland, plus I grabbed a beautiful red Lenox Holiday Tablecloth for my dining table for under $100 total. I find such great quality when I shop at BJ’s and I love knowing my dollars are being well spent. 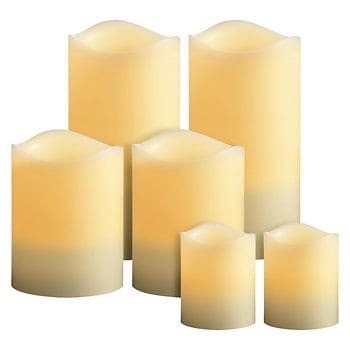 I had planned to get a set of the Veraflame TrueFlame 6-Pc. Flameless Candle Set (look for item #93638) as I wanted to do a DIY and transfer photos onto them of Christmas memories, but that’s a project that’s going to wait for another day (and another post). I did, once again, realize I needed to add more to the stoop at the front of the house when I was doing photos. We have an older black milk can that I brought out, but I think that next time I’m at BJ’s I’ll grab two log planters and maybe 2 of the pre-decorated pre-lit trees I saw outside. Think that’ll polish the look for us for the holidays? 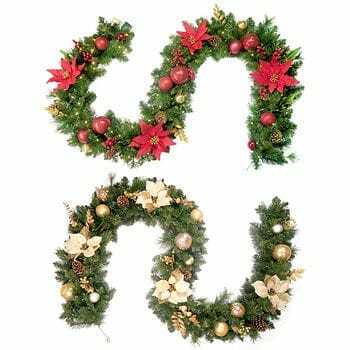 *I’m heading back to purchase a second garland, as I’ve decided to put one on our light post at the end of the driveway. I think it’ll tie things together and look really pretty! You’ll also want to grab one of the multi packs of AA batteries when you’re at your local BJ’s- you’ll want 3 AA batteries for each of these pre-lit decorations for your door. We love the Berkley Jensen brand batteries and use them frequently here. What do you think of my easy front door holiday look? This comes in a beautiful Christmas red and also a holly print. Each tablecloth comes in 3 lengths and includes a set of matching cloth napkins. Now, I’m not just a shopper for decor at BJ’s. It’s a one stop shop and that’s why I love it so much. I was able to get what we need for Thanksgiving dinner, a few gifts for family and friends, a new book for me to read AND my front door decor items. BJ’s helps save Members like me from the holiday stress by offering everyday low prices on fresh food, décor gifts and other essentials…so I can make ONE stop instead of multiple when I have things to check off my list. This is a sponsored post written by me on behalf of BJ’s Wholesale Club. That garland looks so great!! I guess I will buy one. Thank you for sharing the post! Such a festive look! I love how easy this is too!! We have a garland but I put it on the banister. I think I should get some more and decorate my entry way too. Thanks for the idea. Your door looks so pretty! So pretty! I really need to step up my game with my doors. 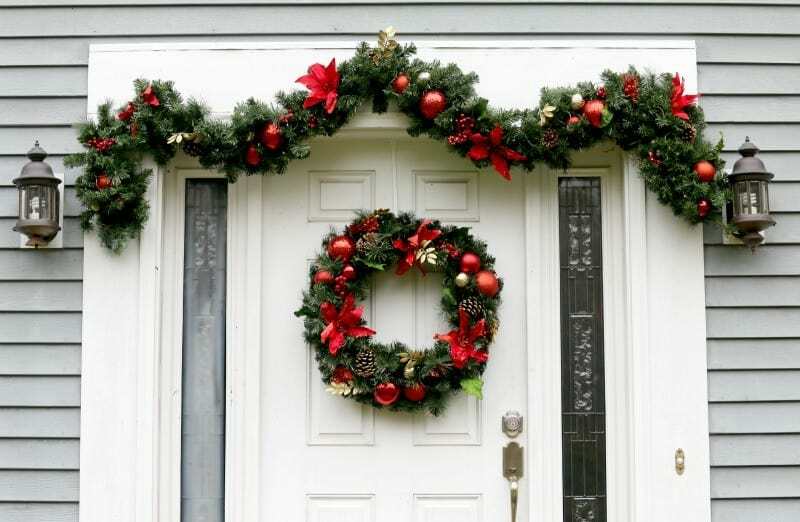 I have a double door so I can imagine how cute it would be with the garland. This is so pretty. I love to see decorations like this. It doesnt look to hard. I bet it wasnt all that expensive to do and adds lots of cheer. Simple. Classic. Perfect. This is totally my style. We need to upgrade our lights for sure! I love the way that your entry way looks! I’ve been wanting to get a wreath, but just haven’t found one that called out to me yet. That garland is beautiful! The red really pops against the white door, beautiful! That is definitely simple but wow, SO cute!! I’m not great at decorating but I can definitely handle this! I love the way your front door looks. Its so fun and festive. We recently added some garland to our door too. Love BJs for great deals on everything. I want the Wreath and Garland that is already prelit. I think this would love gorgeous on the front of my house. The garland and wreath are not expensive! 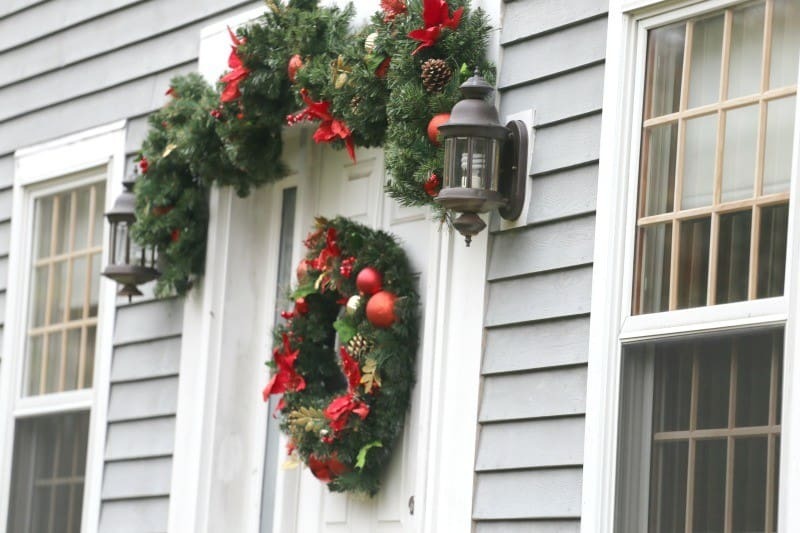 I love the idea of lighted garland and wreath on the front door. It makes such a festive impressive for everyone coming in. I really like the garland and the wreath. It’s nice and festive without being overdone. I’m at BJ’s every week, their double sided wrapping paper is THE BEST!!! These decorations are so gorgeous. I need to pick something up for my front door. Yours looks fabulous! We don’t have a BJ’s Wholesale nearby. Boo! But I do love your decor. The wreath and garland are perfect! I love having a wreath like that on my door. 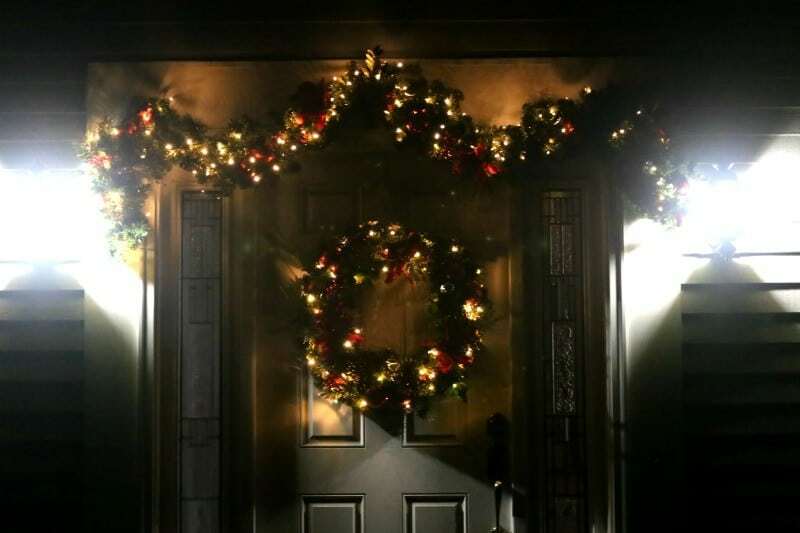 Now that is beautiful looking front door decorated for Christmas. Love the day and night photos to show the difference. I have an idea now about decorating our front door. I love the looks of that! I adore decorating for the holidays! Your door is so festive and gorgeous. I love shopping at BJ’s when I’m near one. There’s always something I just have to have. 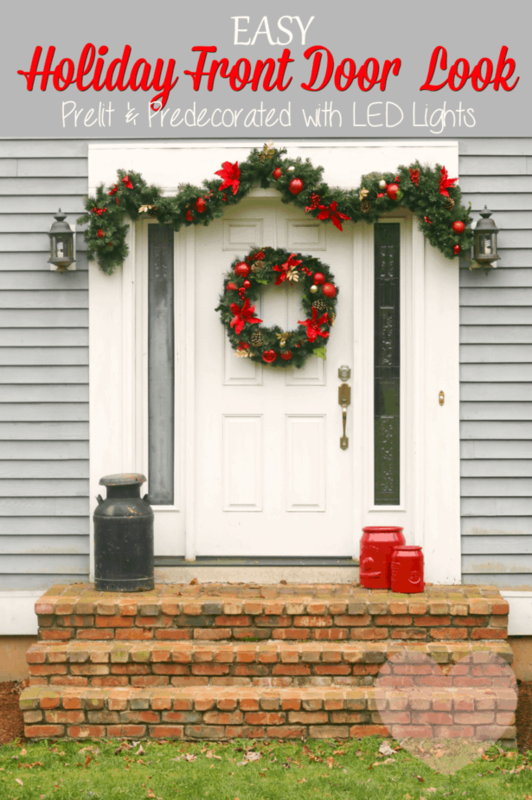 I love your front door decor – it’s different and festive and oh, so pretty! I’m laughing at what your husband said. Husbands sure do help out a lot with the blogging side of life. Mine sure does too! This looks simple and perfect not too much, I love that the garland already has built in lights.